This is a quiet, semi-secluded 3-bedroom home on a dead-end road. Queen bed in 2nd floor master bedroom, queen bed in 1st floor master bedroom. Double bed and bunk beds in 2nd floor 'kids' room. Plus, a carpeted loft that overlooks the living room suitable for sleeping. There are also 2 couches (1 is a fold-down) and a day bed in the basement rec room (which includes a pool table). We have kayaks, canoe, and a rowboat for renters. We are on crystal-clear Sunset Lake which is 5 minutes up in the mountains from Alton Bay on Lake Winnipesaukee. Flat screen TV with expanded basic cable service, and WiFi provided. We are thirty minutes from Weirs Beach and Laconia (Bike Week) and about the same from Loudon (NASCAR). Discount to law enforcement, firefighters, EMTs, military, or retired therefrom (with proper ID). We rent by the week in Summer (late June-early Sept) and by the week or weekend the rest of the time (mid April-mid November). We would also entertain a full-time Winter renter (mid Nov-mid Apr). Our home was built in 1988. We co-own with family and there are eight kids between us (with some grandkids, as well now). There is plenty of room for all and lots of fun, especially in Summer. One of the owners is retired law enforcement (39 years) so we like to give a price break to anyone involved in hazardous duty jobs, including active and retired military. 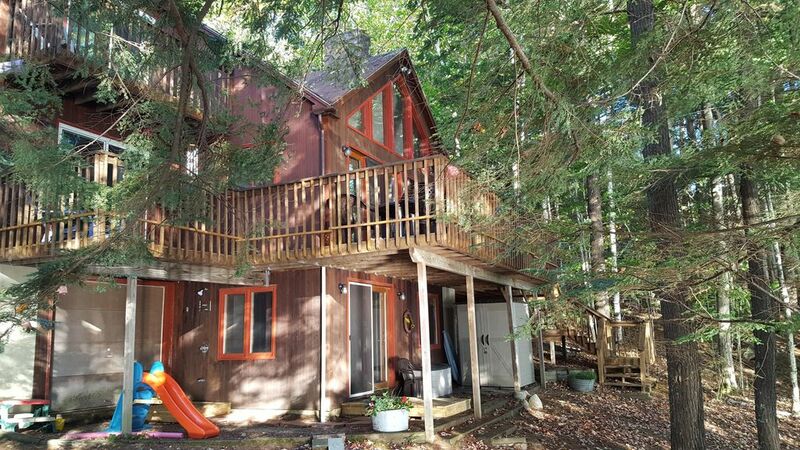 We love our secluded 1.5 acre+ lot with over 200' of waterfront privacy. At night, the loons are heard quite clearly. Quiet lake, even in summer. NOT a lot of boat traffic on Sunset Lake. There is NO public boat-launch area on the lake, and there is NO launching of powerboats from the 19 properties in our neighborhood. Once again, we had a great time on Sunset Lake. Lots of fun in the sun, cute moments with kids and cousins. Weather was great, and the house was very cool at night, even without a/c. The back roads around the lake are perfect for running. Dogs loved running around in the woods. Lots of opportunities for daytrips and excursions to nearby attractions. Weirs Beach, Wolfboro, Storyland, etc. Found some great little spots for dining and shopping. I highly recommend "The Rusty Moose" diner in Alton Bay, by the way (located over near the Hannaford's grocery store). as our contact has been with the owner, we are in for a great time. I have never had such a great experience booking an place as I have with this cottage. The owner is amazing . He is so accommodating and truly cares that my family has the vacation of a life time. I will write a cottage review when our vacation is over. I can wait to go!!! Lots of great memories this past summer. Our 6 month old son loved the water, listening to the loons, watching sailboats, and going for walks around the lake. It was an awesome sensory experience for him. We loved every minute. We didn't really feel the need to go anywhere else for the week, and just spent our days lounging, soaking up sun, and enjoying each other's company. It was clean when we arrived, and clean when we left. We haven't been on a real vacation in about 3 years, so this was a perfect way to spend our first summer vacation as a new family. Lakes Region of New Hampshire. Lots to do, especially in summer. $2,750 week in season. NO in-season partial weeks. $300 discount to qualified renters with hazardous duty/military I.D. or retired therefrom. Season is mid-June to mid-September. Weekends and weekly rates lower Spring and Fall. We would consider a winter renter. $1,000 a month, plus utilities and plowing. Contact if interested.